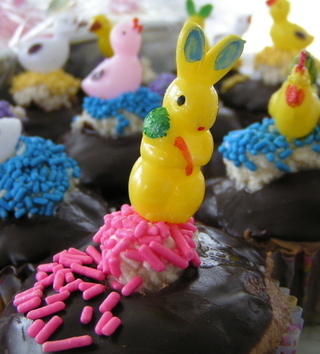 As predicted, Marsha has come to the rescue for my problem with the weeping whipped icing on my Easter cupcakes. We think it is because I used skim milk instead of whole milk. I will have to try it all again! Marsha also says that she fills the cupcakes first and then dips into the Ganache. You should see the gorgeous cupcakes she makes. There is a reason she is called "Marsha Stewart."